Batavia City Hall is located at 100 North Island Avenue, Batavia, IL 60510; phone: 630-454-2000. Photo: Mrs. A. W. Gridley House, ca. 1906, 605 North Batavia Road, Batavia, IL. 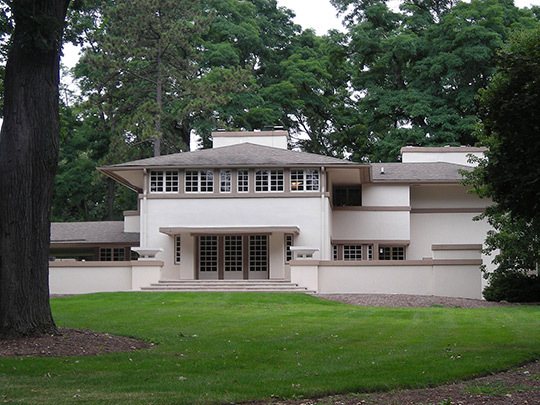 Home was designed by Frank Lloyd Wright. Listed on the National Register of Historic Places in 1992. Photographed by User:G LeTourneau (own work), 2007, [cc-by-3.0 (creativecommons.org/licenses/by/3.0)], via Wikimedia Commons, accessed June, 2014. Bordering the Fox River, Batavia was first settled about 1833 and incorporated in 1872. Batavia was named by early settlers for their home in New York (See Batavia, https://www.livingplaces.com/NY.html">NY). The business and residential sections are about equally divided by the river into an East Side and a West Side. As in Aurora, the post office, city hall, and other municipal service buildings are centrally located on an island. Factories that line both banks of the river manufacture windmills. Among the earliest sites chosen for settlement following the Black Hawk War (1832), Batavia, because of its triple advantage of water power, fertile soil, and surface limestone, began its industrial career in 1837 with a flour mill. By 1850 it had developed an extensive commerce in limestone, which gave it the nickname of "Quarry City." Several fine old houses built of this local stone still stand along the highway. Among these are Lockwood Hall, and the Snow House, at the southern edge of town, both in the Greek Revival style. Right on Union Avenue is Bellevue Rest Home, built in 1856 for the Batavia Institute, a private academy soon superseded by public schools and taken over in 1867 by Dr. R. J. Patterson, a specialist in mental and nervous disorders. Mary Todd Lincoln was a patient here in 1875. The room she occupied retains the ornate dark walnut furniture fashionable in her time.